"Millennia ago, the Earth was struck by an asteroid from space. The dominant species-- the dinosaur-- died out. Sooner or later, it will happen again. Or a virus that cannot be controlled will sweep the Earth. Humanity-- civilization-- will be lost due to a lack of vision and unwillingness to face the inevitable. We are stranding ourselves on one tiny blue orb." Such was the driving concern of a brilliant young scientist named Thaddeus Romero Hoskins. An arrogant elitist born to a rich family, Hoskins graduated M.I.T. at the age of fifteen. However, Hoskins' social skills never developed properly, and he felt alienated by all around him. Hoskins was inspired to develop a robotic model for military application that consisted of an inhuman head attached to spidery legs. Dubbed a "headman," it could decapitate enemy soldiers in the field and reanimate their bodies to act as cannon fodder for its controllers. Those in scientific circles, including John Henry Irons, were unaware of the robot moving beyond the theoretical stage. Later, Hoskins body was discovered, his head detached by a laser, and his brain missing entirely. Hoskins had decided his human body "wasn't capable of completing my vision, so I created a new one, improving on the work of Will Magnus, whereby placing my brain into it." In a powerful new bipedal shell, Hoskins renamed himself "the Headmaster," and set his master plan into motion. He re-purposed a former NORAD installation, dubbed the Ark, and designed as a nuclear bomb shelter. From here, the Headmaster set to work on a massive spaceship that could carry the finest examples of humanity off their home planet. In need of a work force to carry out the task, the Headmaster created an army of headmen. He then sent them out to kill and commandeer the bodies of homeless people to construct his craft. The murders of two police officers, who stumbled upon one of Headmaster's victims under the control of a headman, attracted the attention of private investigator John Jones-- secretly the Manhunter from Mars. Using his shapeshifting abilities to assume the visage of a derelict, J'Onn J'Onzz staked out an alley until he was attacked by a headman. After being wounded in a struggle with the device, the Martian Manhunter took its remains to the JLA Watchtower for further study. With the aid of Steel and Oracle, the Manhunter located the Ark and its contents. The Headmaster met with J'Onzz, hoping to convince him of the merits of his plan, so that he would not lose precious time by abandoning the base. Dedicated to the preservation of all life, equally treasured, the Manhunter from Mars declared himself the Headmaster's implacable foe. A scuffle ensued, which ended with the Martian Manhunter burying the Headmaster under his own space ship. The damage Headmaster took deactivated his headman, and pieces of his robotic armor were uncovered after an explosion leveled the Ark. It is unclear whether Hoskins' brain was still within the Headmaster body, or if he is perhaps still at large. The full capabilities of the Headmaster cyborg are unknown. It was extraordinarily strong, with energy emitting gauntlets. Hoskins could control his army of headmen through the suit. 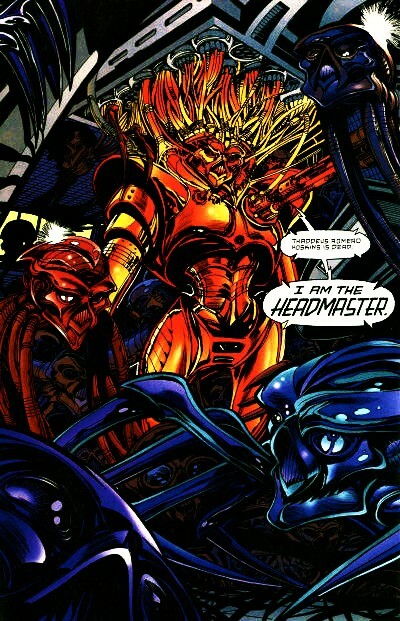 The Headmen were spider-like robots created by Hoskins to do his bidding, with heads resembling the Headmaster's. Standing at roughly two feet tall, with long arachnid legs tipped with blades, the headmen were controlled by human brains wiped clean and "reprogrammed." The headmen were often assigned the task of decapitating derelicts, dipping their spiked limbs into their victim's chest cavity, and replacing their headspace with its own. The headmen could then animated the deceased bodies to perform most motor functions. To facilitate this act, the headmen were armed spectacularly. A laser beam emitted from their right ocular cavity could kill most people on contact, and were capable of momentarily blinding one of the most powerful super-beings on Earth. Their electronic eyes were further enhanced with thermal and radar imaging. The headman robots were physically resistant to incredible amounts of damage, and were both quick and agile. The Headmaster was constructing a spaceship the size of a small city, before its destruction and his disappearance. Quote: "They were merely riff-raff. As it is, they serve no use to society; working here, they have a purpose." Thank goodness that unlike his DCU counterpart, the Earth Prime Al Gore decided to just make a documentary. I wonder if we will ever see this guy again? I doubt it, personally, but you never know. If Geoff Johns ever does anything with J'Onn solo, definitely. Otherwise, no.